You are here: Home › What’s new › Brewing Smoke › Our new resin pipe resonates with the past. Our new resin pipe resonates with the past. Why our new resin pipe resonates with the past. As I write this pipe review I’m smoking our new resin pipe. I recall another resin tobacco pipe, a Hilson Fantasia churchwarden, I owned many years ago. At the risk of dating myself, well ‘risk’ may not be the right word – ‘prospect” would be better – since no one else will go out with me, I owned the Hilson in the 1970s. It was a Meerschaum-lined resin pipe with a multi-color design. It was a nice pipe that I smoked quite often but sadly, it has vanished. I think it broke, but I may have simply lost it during one of my many moves through the decades. This new iteration of the resin pipes comes to us from China. Instead of a nifty Meerschaum lining, this pipe has a heat-resistant plastic or hard rubber insert. The insert can be removed to aid in cleaning. My best guess as to its purpose is that it protects the resin bowl from excess heat. The insert itself does get pretty hot which you will notice if you put a finger on the top of the bowl while you smoke the pipe. This is our second line of pipes coming from China. The F.E.S.S. wood pipes are also made in China. How well does the resin pipe smoke? The pipe is nice to hold both in the hand and in the mouth. It doesn’t have the exact feel of a briar pipe in your hand, but it has substance to it. It looks good, at least to me, with its smooth curved stem. It is a pipe you can hold between your teeth easily. I’ve been testing this pipe for a couple of weeks now and find it to be a remarkably good pipe for the price. The insert only goes about halfway down inside the bowl so your smoke will be shorter than the outside of the pipe would suggest. The good news is that you don’t need to break the pipe in as no carbon build up is necessary for this pipe. I recommend letting the pipe rest between bowls, although a rest isn’t strictly needed. The draw, if packed correctly, is good. Cleaning is easy enough. After the pipe has a chance to cool off you can remove the plastic/rubber insert if you want to swab the inside of the bowl. I do that after smoking several bowls but not every time I clean the pipe. You will want to twist the stem from the shank and remove the metal piece that fits into the stem. This metal piece holds back much of the moisture that would travel up the stem and requires cleaning. Pipe cleaners will do the bulk of the work of cleaning the stem and shank. I tried to replace the metal stem insert with a 9mm pipe filter but the opening is just a bit too small so I stuck with the metal insert. I found I couldn’t run a pipe cleaner all the way through the stem. This might not be the case on all these pipes, but on mine, I could get the pipe cleaner part way down the stem by pushing it in from the mouthpiece. It seems to stick about where the stem widens to hold the metal insert. I just use a pipe cleaner going in from the other end to clean the lower part of the stem. The small round ring fits into a groove at the top of the shank. 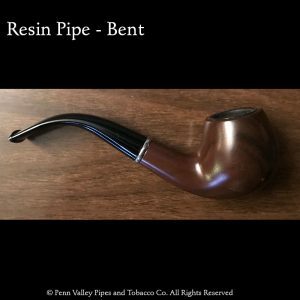 The resin pipe is a pipe for just about every pipe smoker. If you are new to pipe smoking and don’t want to invest too much, this would be a great pipe to start with. If you are a veteran pipe smoker you might very well want to add this to your collection. It makes a decent workhorse pipe that won’t break the bank. This is not a collector’s item or a trophy pipe to display behind a glass case. You can buy this pipe with confidence that it will provide a good, sold smoking experience. Did I mention it’s very affordable at just under $20? Hard to go wrong with our imported resin pipe.